A fresh perspective renews Karen Mingst’s classic, concise text. 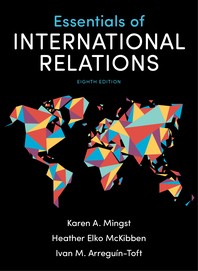 A new chapter on international cooperation and international law presents alternatives to war. A streamlined approach to theories and levels of analysis makes concepts easier to understand and apply. Expanded coverage of cybersecurity, refugees, health, and the environment asks students to grapple with the big issues of our time. And InQuizitive—an all-new digital learning tool—helps students learn, retain, and apply key concepts. As they do in their own courses, coauthors Heather McKibben and Karen Mingst introduce topics and events that stimulate student interest and classroom discussion. Drawing on her experience teaching a large introductory course at the University of California, Davis, McKibben worked with Mingst on key structural changes that make the text even more accessible. Book specific study tools help students understand the reading and apply what they’ve learned. This ensures they arrive better prepared for lecture. And assessing students is easy with the variety of activities built specifically to complement the book. Instructors have always appreciated Essentials of International Relations’ low price and concise format, allowing them to incorporate outside readings. Those who package the text with Essential Readings in World Politics save 50% off the price of the reader alone.